To celebrate my birthday this year, we took a trip to the Canadian Rockies. (In fact, we left for this pre-planned trip one day after returning home from our unexpected trip to Ohio!) 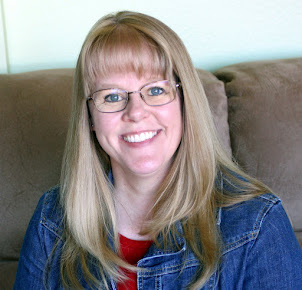 We enjoyed the nine-day trip, which I'm sharing about today along with some more finds for Rinda's Summertime Photography Scavenger Hunt. Our trip started in Edmonton, which provided the perfect opportunity to meet Ginger! Ginger and her husband Marvin treated us to brunch at The Highlevel Diner. The food was fabulous (especially the huge cinnamon rolls we took with us for a snack later that day) and we all hit it off immediately. Of course, I already felt like I knew Ginger from her blog, so our time together was like meeting up with old friends we haven't seen in a while, catching up on our lives, and enjoying a great meal. When my blueberry pancakes arrived, I knew immediately there was no way I could eat such a huge meal . . . so I took it with us and Robbie & I enjoyed it for breakfast another day! Ginger had also brought me a wonderful gift (which you can see on her blog here) and handmade card. Thanks Ginger for a lovely gift & the perfect start to our vacation - it was so much FUN to meet you in person! We spent the rest of our week in Banff in the Canadian Rockies. On the drive to Banff, I captured my second submission for #7 - A Rural Landscape. I'm sure many of you can guess why I like these fields of canola! 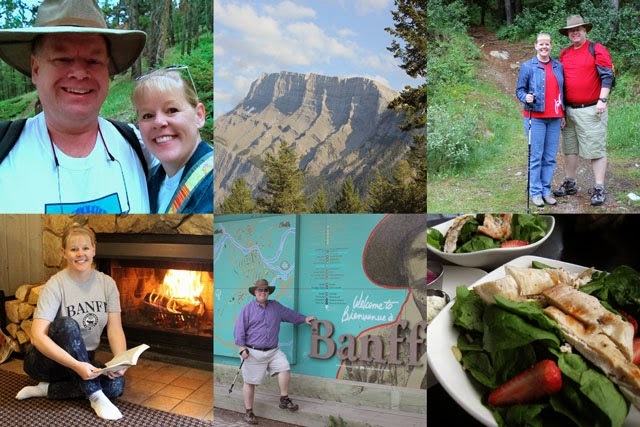 This was our sixth trip to Banff (including our first trip when we were married there in December of 2001), and we had FUN eating at our favorite restaurants, browsing the shops on Banff Avenue, hiking (which I'll be sharing more about in an upcoming post), and relaxing in our condo at the Douglas Fir Resort. I snapped this next photo for #20 - A Bus with a Picture Painted on its Sides right outside our resort. In fact we spotted quite a few buses on this trip. I especially like the one that was parked outside the Edmonton airport that read "The Every Day Way To Houston." 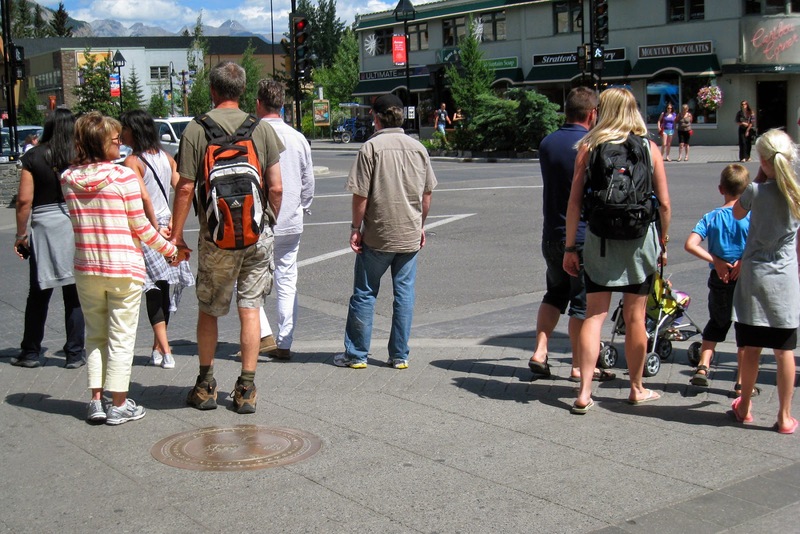 We had no trouble finding #4 - A Group of Tourists as they were everywhere, especially congregated waiting to cross the streets along Banff Avenue. It was also easy to find #16 - A Sign in a language other than English because many of the signs (like the one below at the trail head of our first hike) are in English and French. 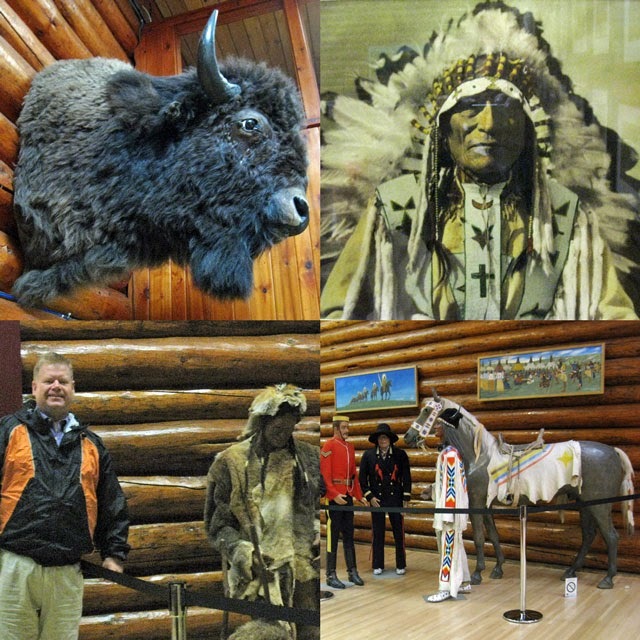 We had rainy weather one morning, so we decided it was the perfect time to visit the Buffalo Nations Luxon Museum. 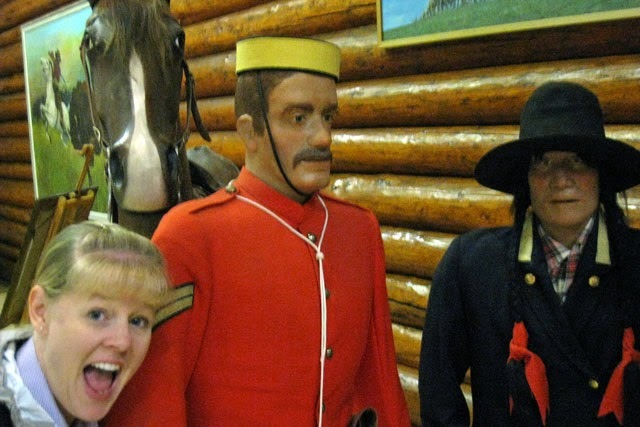 I had a bit of FUN sticking my head into this photo (which I'm offering as my second submission for #10 - A Photo Bomb). 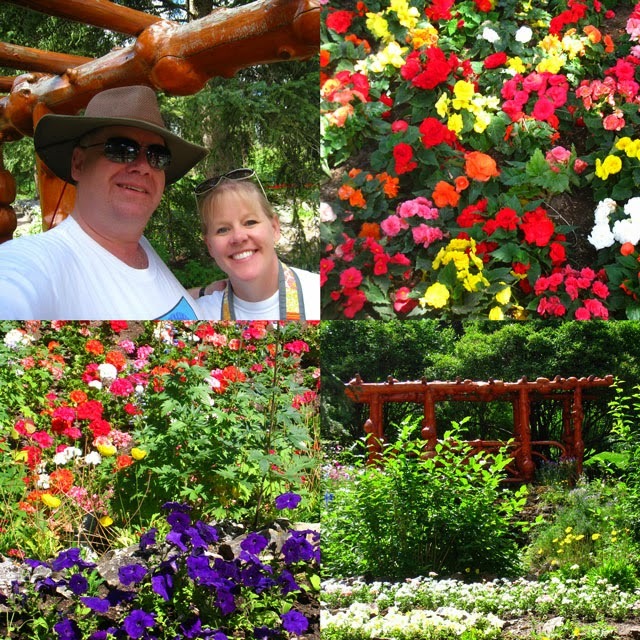 We also visited Cascade Gardens, which works for #19 - A Public Garden. We saw more wildlife on this trip than we ever have, some of it as close as our balcony or alongside the road where we were walking! This was definitely a FUN summer trip and the perfect way to celebrate my 45th birthday! The best part of it was getting to spend nine uninterrupted days with my sweetheart! I hope you've all had a chance to travel and have some FUN this summer! What a great collection of pictures, though of course my favourites are that final picture of the two of you and the ones with Ginger! Fabulous pictures. The buses are my favourite. Love those buses! Looks like you had a really nice time. 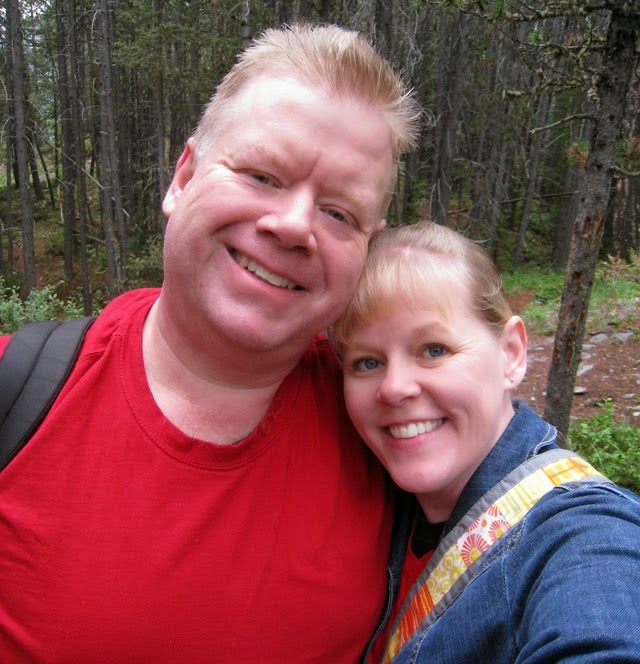 We stayed for a few days in Banff about 10 years ago and loved it! What a lot of fun you had on this great trip and lucky you getting to visit frequently. Extra nice to meet up in person with a blog friend it really is like getting together with an old friend. 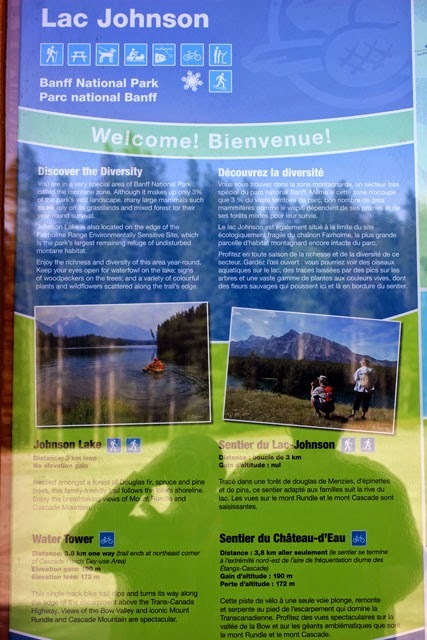 The Canadian Rockies are on my bucket list...thank you for this fun tour! 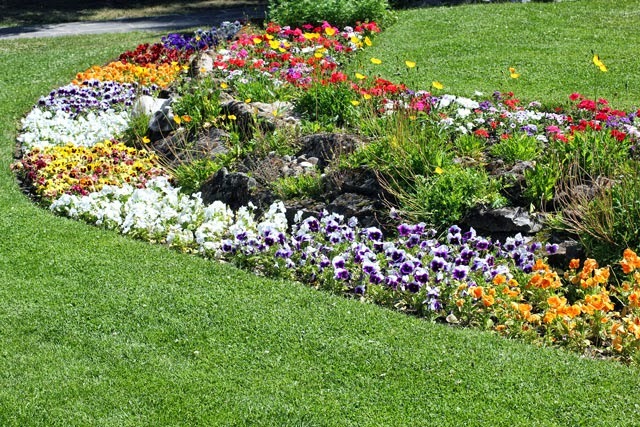 Beautiful gardens! 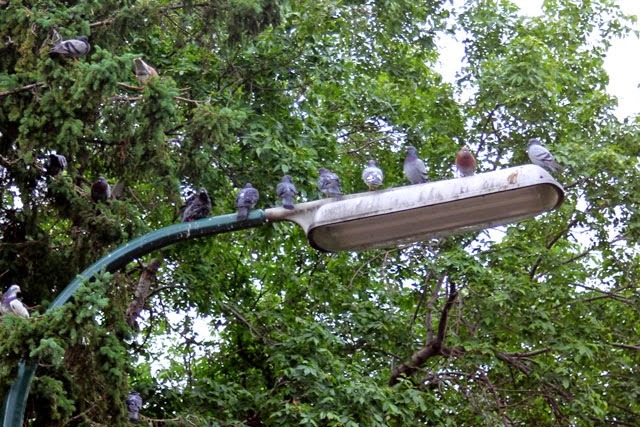 I too am seeing birds perched on everything but wires. Taking lots of "insurance" shots - come Sept. 22, I might well be using all of them! looks like you were being photo bombed by the animals in Banff! Your pictures tell the story of a fun, busy, relaxing vacation! Happy Birthday friend, can't wait to share a late celebration with you and hear even more about your wonderful trip! 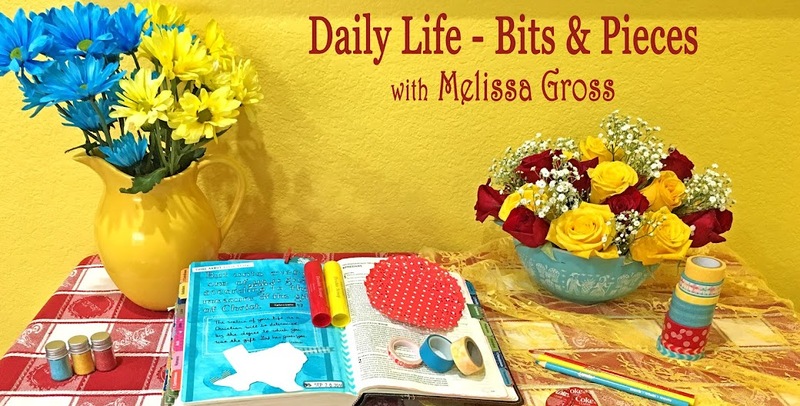 So happy to hear you had a wonderful vacation Melissa! Your photos are beautiful and you managed to get lots of scavenger pics! Again, it really was lovely to meet you and Robbie! Just seeing that picture of the four of us is making me crave those buns!!! haha! what a lovely selection of photos, looks a beautiful place. How fun to meet up with Ginger. It looks like a great trip from those snaps. Great finds! The Canadian Rockies are #1 on my travel bucket list. I'm hoping for next summer. Our holiday trip this summer has been postponed until October, but we're enjoying two weeks with Sarah and Caleb! And Adam will join us early next week. Some lovely photos and the one of the two of you at the end is just so cute! Glad you had such a happy and FUN trip. 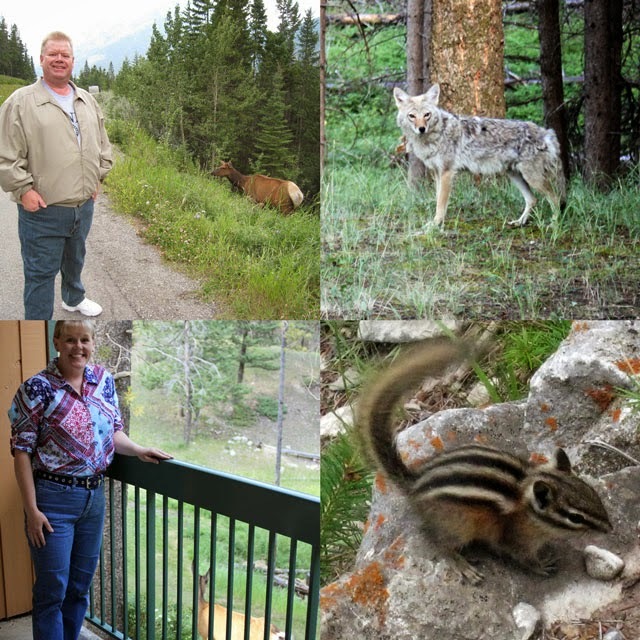 Thank you for such a lovely post Melissa - your vacation looks brilliant - so much to see and enjoy - especially the wildlife! 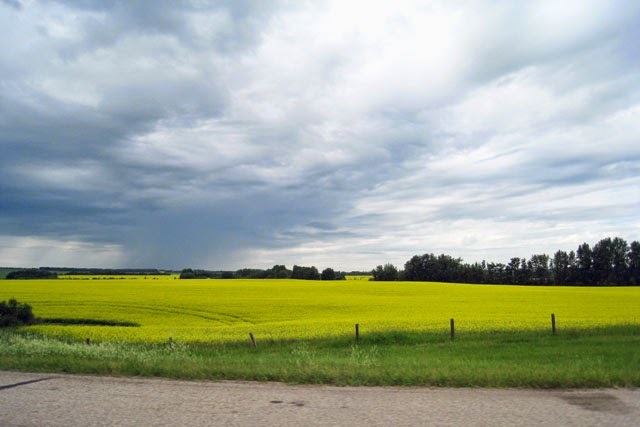 Great photo of the canola fiels too. Two of my favourite blog friends meeting up, how amazing is that. Oh I bet it was non stop chatter. 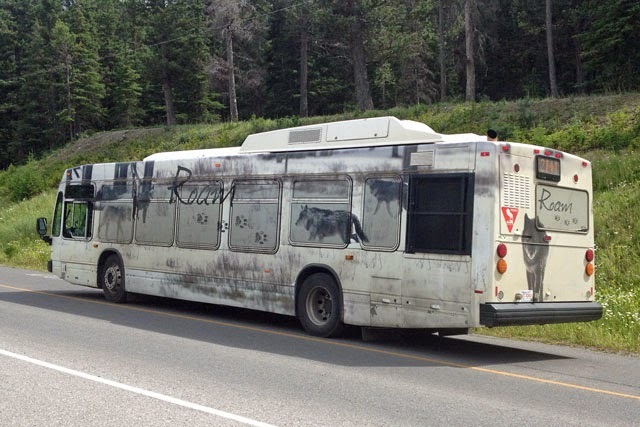 Wow - I love that roar bus! Great photos it looks like you had a great time. Happy Hunting.